Three Dickinson students, Shayna Solomon, Patrick Schlee, and Edwin Padilla, working with Todd Bryant of Academic Technology, and Ed Webb, Associate Professor of Political Science and International Studies, have created two historical scenarios using the game “Civilization V” and the software “ModBuddy.” Todd Bryant passes along this report. 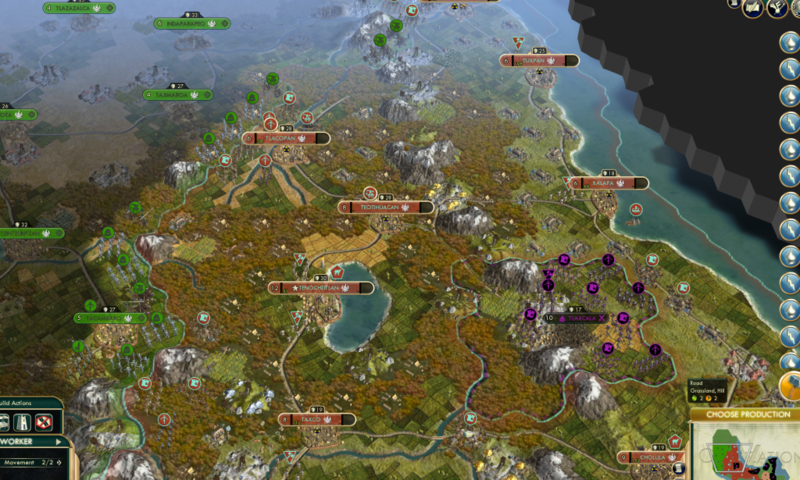 The first scenario is an updated and expanded version of a mod created by Todd Bryant in “Civilization IV” covering Europe and the Americas in 1492. The second scenario was developed from scratch and covers Europe and Africa beginning in 1876. To the greatest extent possible, each scenario accurately depicts the size of empires, geography, resources, diplomatic relations, military strength, scientific progress, and religion for the major civilizations of the time period. In addition to accurately recreating variables already within the game, the students used XML to change the underlying database of the game to create additional resources, military units, and social policies. Additional logic was also built using the coding language LUA to include the Atlantic slave trade in the 1492 mod and Rinderpest, the Berlin Conference, and malaria for the Africa/Europe 1876 mod. 1492: Aztecs: Playable civilizations include the Aztecs, the Quiche Maya, the Tarascans of Michoacan, the Incas, the Songhai, Morocco, Spain, Portugal, France, England, the Netherlands, Venice, and the Papal State. A more detailed description of the 1492 mod as well as links to download can be found here, and for the Africa/Europe 1876 mod here. Students also wrote an extensive ReadMe file for each mod describing the research on which each mod was based. Each ReadMe file also explains decisions they made due to the limitations of the game and important historical factors that were unable to be included. Both are published and available online and as a ReadMe file within each download where the mods were published. The 1492 ReadMe file is available here, and the 1876 Africa/Europe mod is available here. Two of the students, Shayna Solomon and Patrick Schlee, worked primarily as researchers on the project. Shayna focused on the Africa/Europe 1876 mod while Patrick worked on 1492. Although they spent most of their time conducting research and learning the variables used in the game, they also used the ModBuddy software to design the very extensive maps and modify some of the XML that held any changes to variables in the database. Edwin Padilla was in charge of the technical aspects of both mods. This included learning the database structure underlying the game and how to write database queries in XML to make changes to variables in the database when the mod is loaded. He also learned a scripting language, LUA, which he used to introduce new logical elements to the game including the Atlantic slave trade, Rinderpest, and malaria. The students in charge of research, Shayna Solomon and Patrick Schlee, gained a great deal of experience working with primary historical sources covering a very broad range of topics. They learned to analyze these documents for inaccuracy and historical bias as well as how these variables interacted in order to create as accurate a simulation as possible. For Edwin Padilla, who was in charge of the technical aspects of both mods, he learned two new languages, LUA and XML. He also became familiar with the differences between writing code to create a program from scratch and using an API to modify someone else’s code. Finally, he worked with shareholders, including the other two students and Professor Webb, who were largely unfamiliar with the possibilities and limitations of coding via the API, to determine overall project goals and set priorities. All three of these students can now point to a very public project in the rapidly evolving areas of games in education and the digital humanities. It allows them to showcase their individual skills while working as a member of a team. The mods have been submitted to submrge.org (a University of Harrisburg website tracking the use of commercial games in education), CivFranatics.com (a web forum for the Civilization game series and mods) and Steam (mainstream game and mod distributor). This work was carried out in the summer of 2014, and funded by the Andrew W. Mellon Foundation Digital Humanities Grant, administered by Dickinson’s Digital Humanities Advisory Committee. This entry was posted in Uncategorized on January 26, 2015 by Chris Francese.